When Sister Mary Josephine Fritz entered the postulancy program as a Good Shepherd Sister 70 years ago, she asked her superior if she could take Paul as her religious name. The young postulant had always dreamed of becoming a missionary like St. Paul and hoped to claim the saint as her special patron. Despite never attaining a connection in name with her favorite saint, Sister Mary Josephine maintained a devotion to St. Paul. That’s why she is overjoyed that Pope Benedict XVI proclaimed a jubilee year to St. Paul, which began June 28, 2008, and concludes June 29. The celebration marks the 2,000th anniversary of the saint’s birth. Sister Mary Josephine was one of six Contemplative Religious Sisters of the Good Shepherd in Baltimore who made up the first pilgrimage group to St. Paul in Ellicott City – the official pilgrimage site for the Archdiocese of Baltimore for those seeking a special plenary indulgence during the Year of St. Paul. Sister Mary Josephine called it a “thrill” to visit the Howard County parish and receive the indulgence, a remission before God of the temporal punishment of sin. Father Matthew Buening, pastor of St. Paul, said hundreds of pilgrims like Sister Mary Josephine have visited his church to seek the indulgence and learn more about the missionary saint. He said that the number of visitors to the parish Web site has quadrupled since Archbishop Edwin F. O’Brien designated the Howard County parish as the official archdiocesan pilgrimage site. To receive the indulgence, visitors to the church must offer prayers for the intentions of the Holy Father by reciting the Our Father, the Hail Mary or another prayer. They must also receive the sacraments of reconciliation and Holy Communion, and take part in a sacred function or a pious public exercise honoring St. Paul. Receiving indulgences is having a great impact on the spiritual lives of many Catholics, according to Father Buening. Archbishop O’Brien celebrated a Mass at St. Paul Jan. 25, the feast of the conversion of St. Paul. He dedicated a specially commissioned statue of the saint. Father Robert Albright, former Catholic chaplain at Towson University, will give a presentation on the Epistle of St. Paul to Philemon Feb. 12 at St. Paul. The parish is also offering tours, ongoing studies of St. Paul’s writings and eucharistic adoration throughout the Pauline year. 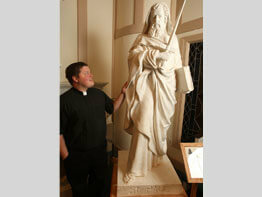 To arrange a visit to St. Paul, call 410-465-1670 or visit http://stpaulec.org.